Provide comfort for the family of James Rhode with a meaningful gesture of sympathy. James E. Rhode, 73, passed away February 20, 2019. Born in Syracuse, he spent most of his life in East Syracuse devoted to his family, close friends and his beloved pets. James was an Army veteran, spending nearly 5 years serving our country. 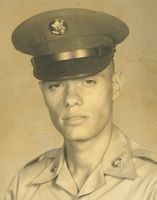 While serving in Vietnam, he earned the rank of Specialist Four in the 1st Infantry Division. “Jimmy” had a very big heart and touched the lives of many while doing things his way. He was predeceased by his father, Earl and wife, Linda. He is survived by his mother, Marguerite; son, John (Marget) and his grandchildren, Elliot and Sienna, who always put a smile on his face. Our family also extends a special thank you to dear friend Melissa Staniec for her loving care the past two years. At this time there will be no formal services, donations may be made in his name to Vietnam Veterans of America, Chapter 103, P.O. Box 675, Liverpool, NY 13088. May the family of James E. Rhode please accept my sincere condolences hoping you find comfort in God's words at Acts 24:15 and Psalm 37:29.